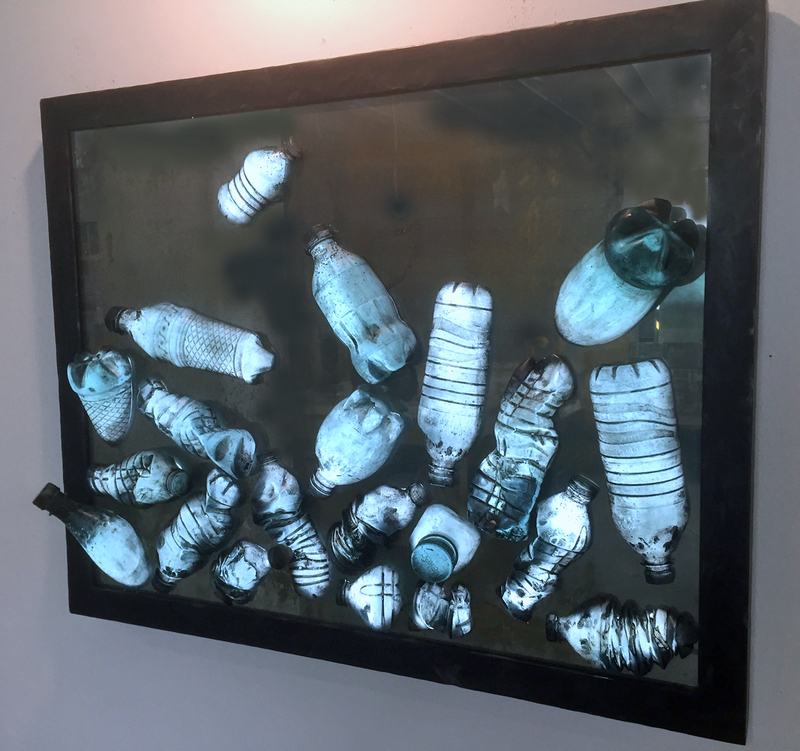 Eco-artist Erwin Timmers newest sculpture made from cast recycled glass will be showcased at the Gateway Arts District’s Open Studio Tour (OST) – Saturday May 14, 2016 from Noon-5pm. 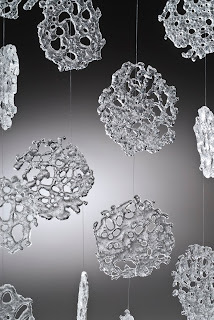 Erwin has been casting with recycled float (window) glass to create forms from and about discarded water bottles – and assembling the cast glass atop a salvaged mirror that has been backed with LED lighting. Its amazing how he can find harmony, balance and poetry in things discarded and never thought of again. 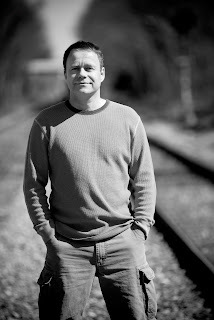 In honor of Earth Day, today’s artist profile is about eco-artist Erwin Timmers. Erwin has become one of the area’s leading “green artists”. Recycling, waste, the environment and how they relate to society are recurring themes in his work – all of which he blames on his Dutch heritage. 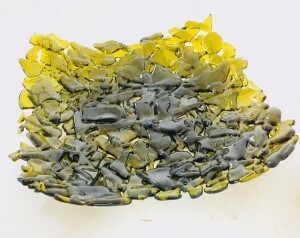 Erwin’s main medium is one of the least recycled building materials; float glass or window glass, and he has had to develop new techniques to work with this material. Originally from Amsterdam, Erwin Timmers moved to California, graduating from Santa Monica College for Design Art and Architecture in 1995. 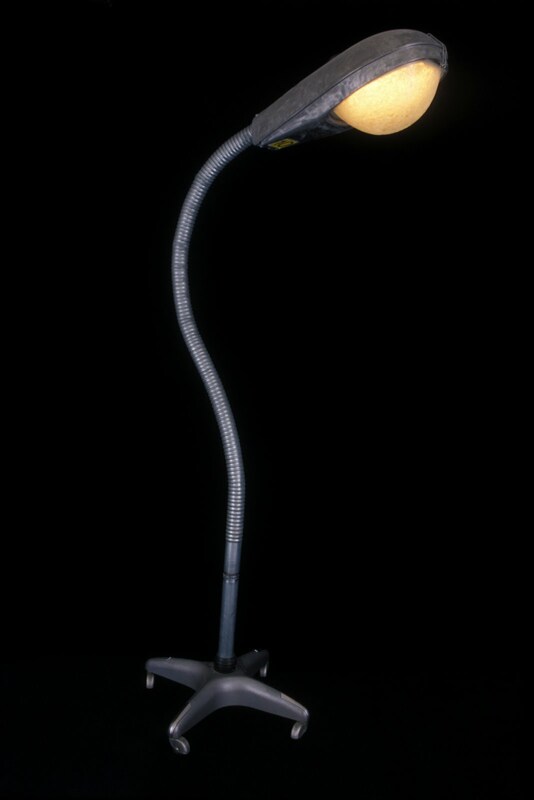 Erwin’s artwork and sculpture has always incorporated recycled materials, and often integrated lighting elements. In 1999 he came to the Washington DC area and along with a new home came a new passion: Glass – creating the perfect marriage of metal and light. 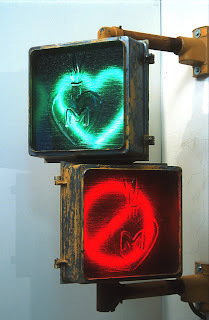 Combining this with found and recycled metal, his work carries strong environmental themes. Seeking to further his knowledge on using recycled glass, Erwin soon found there were few local options that taught glass techniques and recycled glass processes. And with little information available, Erwin became a pioneer in the field, developing his own kiln schedules. Fate would have it that he met up with Tim Tate, who was then starting the foundations for a glass school in Washington, DC. 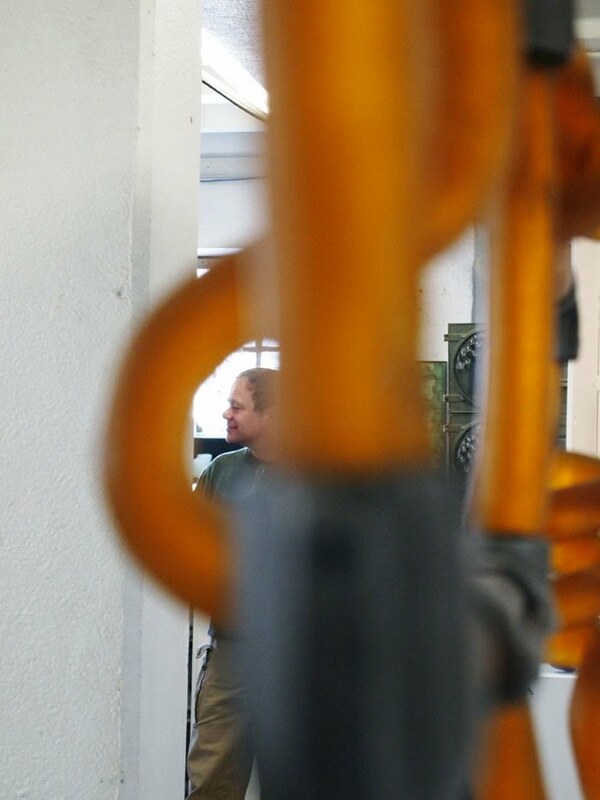 With his experimental approach and his easygoing, accessible teaching attitude, Erwin and Tim started the Washington Glass School in 2001. Erwin developed a number of courses that integrate his love of the materials and his environmental philosophies. His sustainable design knowledge has been sought by other glass schools, and besides courses here at the Washington Glass School, he has been teaching across the country, spreading the word about eco-friendly art. Erwin Timmers chats with Italian glass Maestro Lino Tagliapietra. 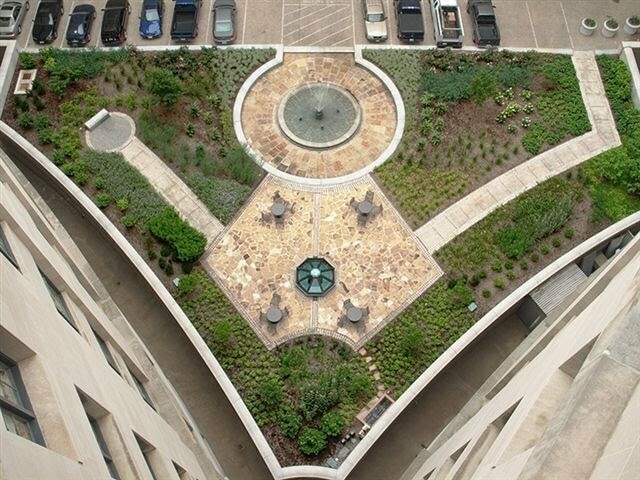 Erwin has also become a leading consultant in LEED Certified artwork. He has received multiple public art commissions and is also featured in numerous private collections. 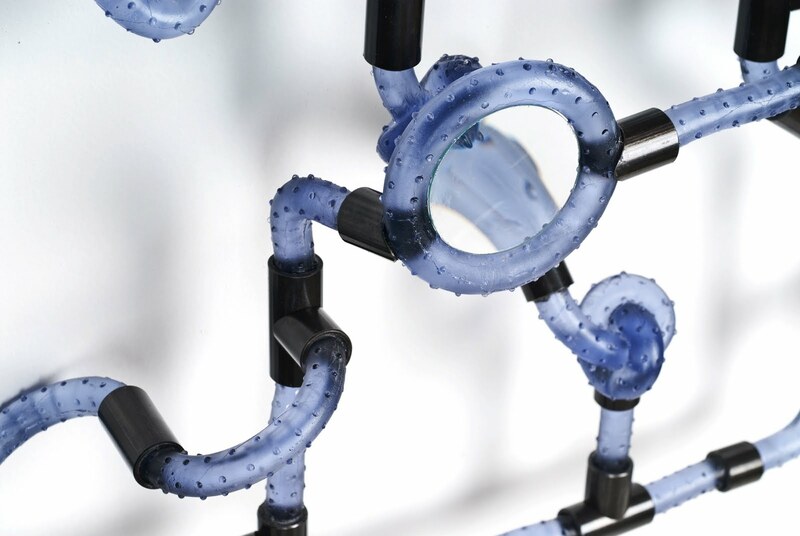 The EPA had commissioned Erwin and the Washington Glass Studio to create an educational sculpture for the courtyard at the EPA’s Washington, DC headquarters. 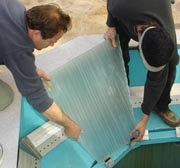 Erwin Timmers and Evan Morgan installing recycled glass panels. Recently completed architectural projects include recycled glass works for Prince George’s County Courthouse and for Fox Architects and he is currently working on an eco-friendly project for the new Safeway in Bethesda, MD. 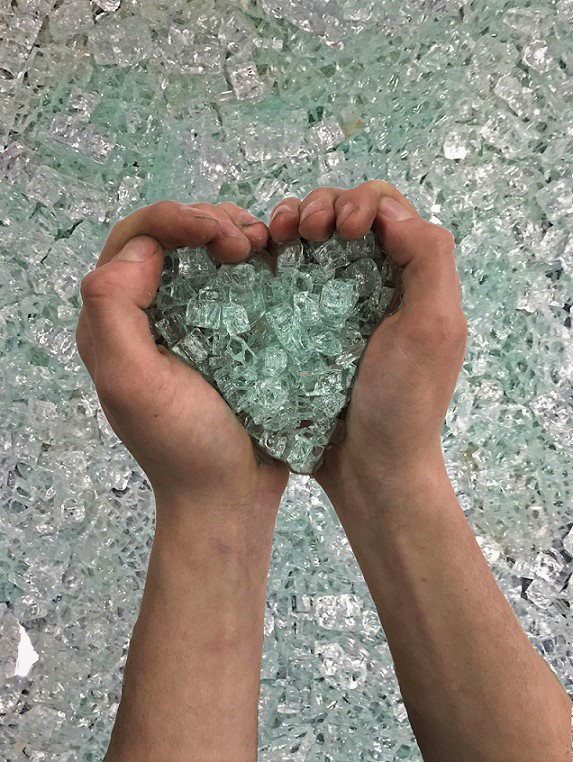 Erwin’s expertise in the field of environmental art is sought out by the media, with interviews on local news stations, including this video where Erwin’s demonstration of tempered glass did not go quite as planned. The Washington Post Magazine has just interviewed Erwin for an upcoming article on recycling, scheduled to come out this June. His artwork is featured in several books, notably “Art Glass Today” by Jeffrey Snyder and “Ideas for Creative Reuse” by Garth Johnson. Two more books that include work by Erwin are due out this Spring/Summer. Erwin’s environmental focused artwork has found an audience, from Miami International Art Fair to local and regional art gallery shows, including and upcoming engagement at Project 4 Gallery this summer. His work showcases the possibility and beauty of recycled material, while encouraging the viewer to consider his or her environmental impact. “What We Leave Behind” cast recycled glass, steel. 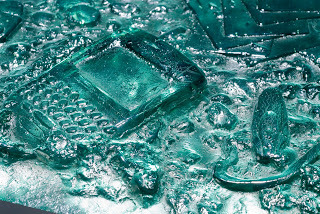 Using glass salvaged from a Virginia office building refurbishment, disposable technology and ephemera from recent decades are expressed as though discovered from a future archaeological dig. 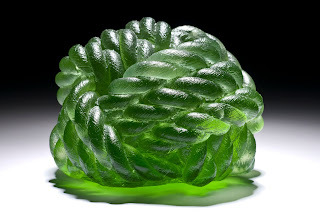 His work is not always appreciated in the manner he expected – a feature on his work on the Artist-a-Day website prompted viewers to ask if the work was made of Jello. Erwin will be one of the artists featured in the upcoming LongView Gallery show Artists of the Washington Glass School: The First Ten Years. The Washington Post Magazine columnist Kris Coronado spent the day in the Washington Glass School this week, interviewing Erwin Timmers for an upcoming article on recycling and environmentally conscious artwork. 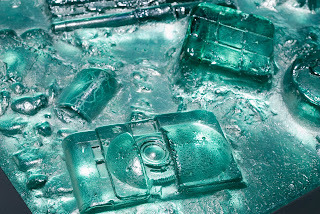 Above & Below: Washington Post photographer Benjamin Tankersley photos artwork made from recycled glass components. Erwin talked wth Kris about his background in sustainable design, and how the growing awareness of the limits to our natural resources has led to a greater appreciation and interest in work made with environmentally responsible materials. Post photographer Benjamin Tankersley set up a full photo backdrop to properly document Erwin’s eco-artwork. The Washington Post article is due out in the paper in early June. Our “guru of green“, Erwin Timmers will be teaching at Cincinnati’s Brazee Street School of Glass, spreading the word of recycled glass artwork. This April 16 & 17, Erwin will have the students explore using recycled glass to make sculptural pieces, architectural elements and tableware. 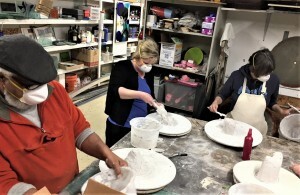 The workshop will cover a variety of techniques including fusing, casting, and slumping. Click HERE to jump to Brazee Street Studios website. Eco-artist Alison Sigethy’s solo artist exhibit Understory, January 6 – February 7, 2011 will be featured in The Art League Gallery at the Torpedo Factory Art Center on Alexandria’s Potomac River waterfront. Alison Sigethy draws inspiration from the natural world surrounding her – from her works made from natural fibers to sculptures made from recycled glass. 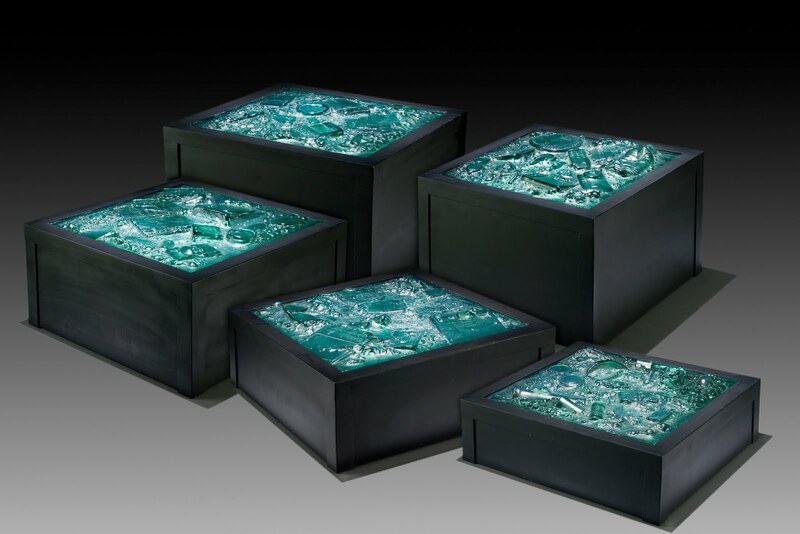 Her multimedia solo exhibit, Understory, will be featured in The Art League Gallery, January 6 – February 7, 2011. With this collection of works, Sigethy is creating an installation that invites the viewer to explore the often unnoticed, yet essential parts of the forest. She emphasizes the “quiet beauty” of the unseen through layers of glass fungi, collages that evoke the striations of cliff sides, and delicate snowflakes. Alison works almost exclusively with recycled materials; the majority of her glass comes from the lenses of solar collectors. Dead tree trunks and driftwood collected on her kayaking sojourns are used as anchors for delicate crystalline elements. The use of these salvaged materials reinforces a pervasive theme in Alison’s work: we, as a culture, generate too much waste. How can we reuse “trash” to create something beautiful? After leaving the world of marketing and print production to pursue both art and kayaking, Sigethy was drawn to glass for its various hues and effect on light. A trip to Greenland in 2006 inspired her to work with recycled materials to create her environmentally conscious work. One of the Washington Glass School’s instructors, Alison was named Torpedo Factory “Artist of the Year” in 2010. The beautiful dark green glass with gold highlights was recovered from the construction site of a Virginia office building where the building was undergoing a cosmetic updating of the facade. The spandrel glass discarded from the old building was used as the basis of the cast glass panels. The presence of excess exists in our day-to-day lives, but often hides behind masks of disposal systems, social acceptance, and misinformation. This exhibition explores the idea of the impact of our excess on our natural environment both visually and theoretically. The art involved will relate to mass consumption and waste’s effects on the environment. Art using these excess materials as a medium will also represent this concept of sustainability in the midst of excess. Artists showing work include Chris Jordan, Eve Mosher, Walter “Tinho” Nomura, Justin Gignac, Akirash, Mikal Hameed, Erwin Timmers, Miles Wickham, Beau Stanton, Destroy and Rebuild, Christina Chobot, Trash Track and more. According to the artist, the series, What We Leave Behind was conceived from the viewpoint of an archaeologist, who might, centuries from now, uncover artifacts from our era. 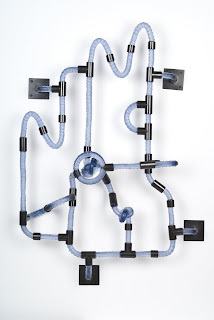 Just like the archaeologist, you are looking down to uncover the items. 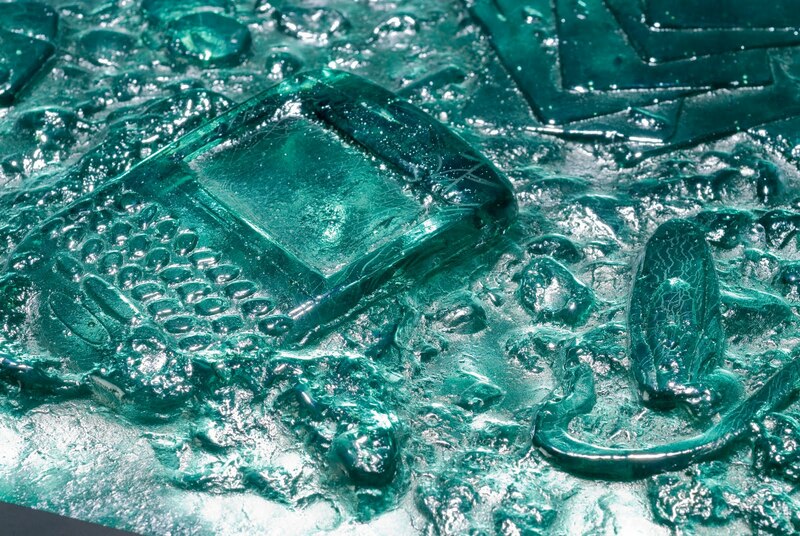 Elements are recognizable from the various decades … objects once in popular use but now resting in landfills. The title of the work is based on the book about our culture of excess and the impact our trash will continue to make long after we are gone: “The World Without Us” by Alan Weisman. The profits from the art sold at this exhibit will be split between the artists and Art for Global Justice, so that we may sustain the local artist community and keep Art for Global Justice’s youth workshops and art exchange program going.